Edinburgh Of The Seven Seas is a solo turn, Florian Mallet of Avignon. He’s also a member of Mudbath, who (according to some) play a form of blackened sludge-core doom rock, which sounds like something I might enjoy, at any rate more than this rather precious acoustic guitar record. When solo, Florian evidently feels the need to indulge his taste for folk-inflected melodic guitar picking and strumming, which is pretty much what we hear on the ten-inch album L’Âtre Et L’Enfant (BUS STOP PRESS BSP#046 / SAKA COST SC#006 / NO EXP REC. NER#003 / MAUDIT TINTIN MT#001). Seven instrumental tracks, all striking a faintly mannered pose of melancholy and deep thought and decked out with poetic titles, of which my favourite is ‘L’Eau Sourde’. All the tunes come close to suggesting vague maritime or sea-faring themes without actually doing much more than conjuring a whiff of salty sea air. Mallet fleshes out some of the pieces with synth drone backdrops to enhance the weather-beaten atmosphere to some degree, which is a good move as solo acoustic playing does tend to reveal his limitations quite quickly: he’s not very inventive with his melodies, which are repetitious and clunky, and his picking technique is rather slow and clumsy. However, it’s a relief to hear an acoustic guitar record without any detectable allegiance being paid to John Fahey or Robbie Basho, which are usually the first two names that get printed on the press release. 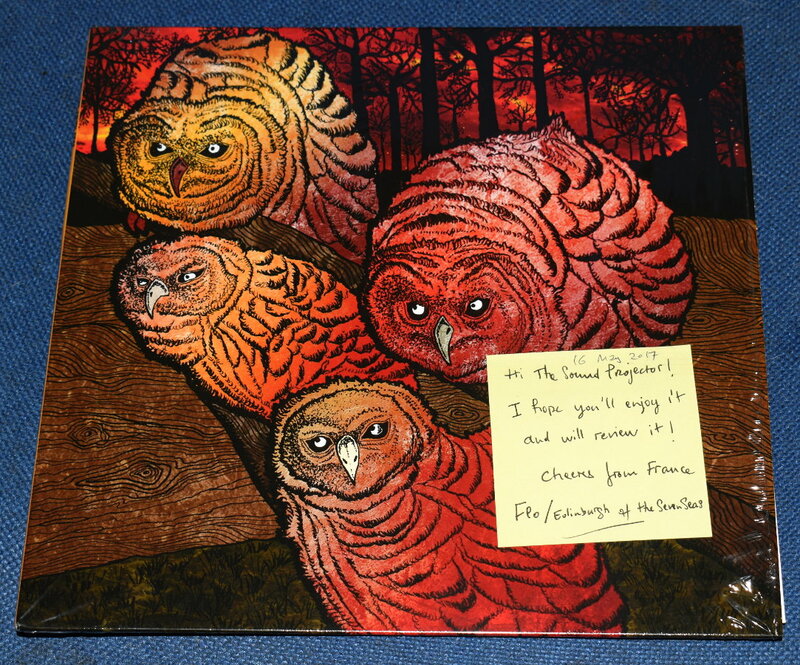 The owl drawings on the cover are also nice. From 16 May 2017.